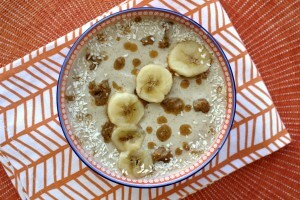 Almond butter bliss smoothie: Kick start your day the healthy way! This almond butter bliss smoothie is one of my current favourites. I make it in the morning or sometimes the night before and bring it to work . This really kick-starts my day. Although this smoothie is dairy and refined sugar-free, I can assure you that you certainly won’t feel deprived. It amazes me often now when I think of how I dreaded giving up gluten, grains and refined sugar. I really thought I was going to be so miserable. Nothing could be further from the truth. This blog would never have been born were it not for my whole food journey. This smoothie is almost like an ice-cream consistency due to the coconut milk and feels more like a treat than an everyday smoothie. You can enjoy coconut milk on the Specific Carbohydrate Diet (SCD) after six months. I have always tolerated it really well and it’s easy to find a pure coconut milk without additives in speciality stores. I buy mine at our local Asian food wholesalers. Packed with healthy fats, coconut milk is my favourite smoothie base. Smoothies are a great way to add calories which can an issue when you first go grain-free. For my first six months on the diet, I regularly attended a dietitian who monitored my weight. Contrary to what I believed would happen, I now actually weigh more not less than I did before starting SCD. This almond butter bliss smoothie as well as my daily avocados are my heroes! Smoothies can be lifesavers when you are rushing. Just buy yourself a proper smoothie glass and you can have a nutritious breakfast on the go. Let’s face it, there is not always time for a more elaborate breakfast of shakshuka and spinach baked eggs. Plus, you’ll look cool and your colleagues will have definite breakfast envy :). A delicious, nutrient-dense dairy-free smoothie to give you a healthy morning boost! Mix all the ingredients, blend and drink or enjoy as a smoothie bowl.